Description: Noah is not having a good year. His mom is in prison, he's living with his mom's boyfriend--who he's sure is just waiting until his mother's six month sentence is up to kick him out--and he's officially hated by everyone at his middle school, including his former best friend. It's Noah's fault that the entire football program got shut down after last year. One day, Noah notices a young bear at the edge of the woods with her head stuck in a bucket. A bucket that was almost certainly left outside as part of a school fundraiser to bring back the football team. As days go by, the bear is still stuck--she's wasting away and clearly getting weaker, even as she runs from anyone who tries to help. And she's always alone. Though Noah ignores the taunts at school and ignores his mother's phone calls from jail, he can't ignore the bear. Everyone else has written the bear off as a lost cause--just like they have with Noah. He makes it his mission to help her. 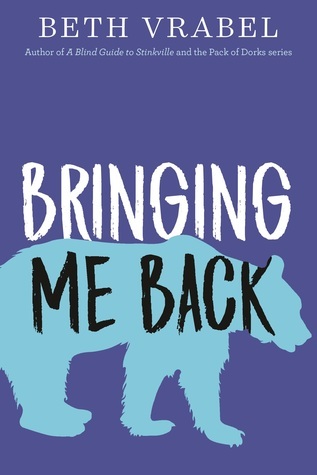 But rescuing the bear means tackling his past--and present--head-on. Could saving the bear ultimately save Noah, too? Why I Picked This Book: I enjoy middle grade and this looked a little darker than the ones I've read in the past so I was curious to see how it was handled. My Impression: While I do enjoy middle grade I typically stick with the more adventure type stories. I honestly didn't see how really serious issues like substance abuse and bullying could be handled in a book geared towards children without being dismissive or melodramatic. However, this book showed me exactly how it could be done. Noah is in a tough place. He's isolated at school by both students and teachers and people he once considered friends are at best ignoring him at worst openly making life difficult. His mother is in jail after multiple DUIs and he had a public shoplifting episode which everyone knows about. He's alone and friendless and so angry he doesn't know where to put it all. Except he isn't - his mother's boyfriend Jeff is always there even when Noah doesn't want him to be and Rina, a girl from school that he's never been friends with, won't leave him alone. As well he has his mother's sponsor, Trenton, pops up with advice support that Noah rarely wants to hear. The fact that the reader is aware long before Noah is that these three characters care about him and will support him cut some of the unhappiness Noah exudes. As well neither of the characters tell him that he shouldn't be unhappy or that he shouldn't be angry at his mother. They encourage him to communicate with her or forgive her but never invalidate his feelings. As well the author does a good job of showing the damage done by substance abuse (Noah's mother is an alcoholic) without slipping into lecture mode. The storyline involving the bear keeps Noah moving forward and gives him something to work towards as well as something to care about. This was a bittersweet book with a thread of hope that always present even with Noah was at his lowest. I loved Noah, Rina, and Jeff especially and was quickly emotionally invested in the book from the beginning. My only issue was that I thought the principal, Mr. Davies, was just a bit too much of a villain but that's personal preference. Since I'm not an expert on childhood education or psychology my only benchmark to tell if I think if this is appropriate for children is to think about whether I would want my children to read it and at what age I would have encouraged it. For me I think this is a book I would highly recommend for children in the 4th to 7th grade range and I think it would work wonderfully as a parent-child buddy read. This is an emotional but not overwrought book with heart and a touch of humor. Would I Read More of this Series/Author? I would! I was really impressed with how she handled tough and sensitive topics as well as just how readable this book was. Would I Recommend this Book? I would. This is a good read for older children as well as adults. Listening: I just finished Big Little Lies by Liane Moriarty and now I'm waiting for my next audio book to come in from the library. Watching: I've been binge watching Trading Spaces since the reboot and have been really enjoying it. We've also been enjoying Fixer Upper lately. I'm not sure what took me so long to start watching it! It's hard to believe that we're ramping down for the end of school. I'm already planning for summer activities again. I am going to keep it pretty low key. He's going to do two weeks of Space Camp again and we'll take a few weekend or slightly longer trips. I'm also thinking about trying out two kids subscription boxes. I'm leaning towards Little Passports and Raddish which is a cooking box geared towards kids. Anyone tried either or know anything about them? Next weekend is my birthday where I will officially be in my late 30s. Getting closer to 40 isn't really bothering me but I have decided to make the month of May my birthday month and I'm going to try and do at least one thing or go at least one place I've been wanting to do/go each week. I'm also back to a yoga program on Yoga with Adriene on YouTube. I had been just sticking with her calendar but I really enjoyed the 31 Day Yoga Revolution so I thought I'd give the original 30 Days of Yoga a try. Most of the days are 30 minutes or less so it's proving pretty easy to work in to my day. I also wrote about a new (to me) website I'm really enjoying called Paperless Post. I'm sending anyone who wants one a free (super fancy) ecard. If you want one leave your email address in the comments. I must warn you my mood has been leaning towards foxes and unicorns lately. So I'm going to confess something - I'm terrible at correspondence if it isn't through email or text message form. And even then I'm not great. I mean I can respond to a question or send a quick message but thoughtful pretty notes are not in my skill set. Then there's the balance of the convenience of email versus the personalization of physical mail. It all makes my head hurt a bit. So when I received an offer to collaborate with Paperless Post I was intrigued. And when I checked out the website I was excited. This I believe is the answer to my problems - well maybe not all my problems but at least my problems relating to correspondence. What is it? 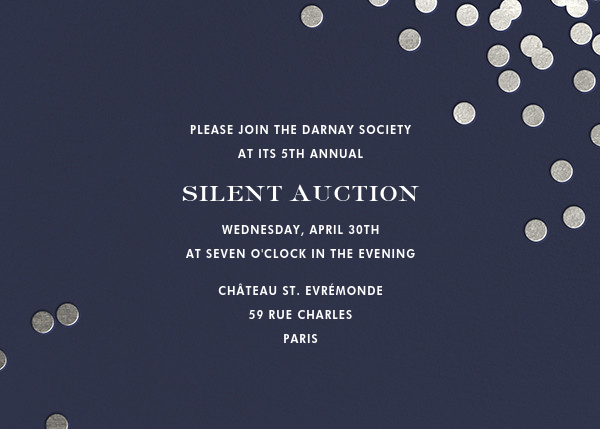 Everything from invitations to greeting cards to stationary just right for dashing out a note ranging from cute and quirky to clean and classically elegant. You can find invitations perfectly appropriate for a 1 year olds' birthday party as well as a professional looking fundraiser notice. 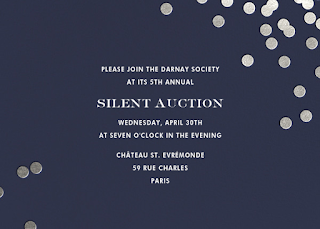 There is stationary from designers like Kate Spade, Oscar de la Renta, Vera Wang, and Rifle Paper Co all with fantastic choices as well as plenty of ways to customize it to suit the exact look you want. How does it work? It kind of reminds me of those ecards that used to be very much a thing but way fancier and with way more options to personalize it. You can pick font and font color, select what the card says and the background of the card itself. It also allows for the recipient of the message to send one back to you. If you're creating an invitation it sets up an RSVP tracking form for you. All you have to do is know the email addresses of who it needs to go to. It isn't free but I didn't find it particularly unreasonable - especially if you consider how much good stationary/cards cost as well as stamps and time spent actually getting it ready to mail. For 20 cards it costs abut $20 total. Since I know I'm rambling bit and this may be hard to visualize but to make it a bit easier I thought I could send everyone a card! Just leave your email in the comments and I'll send each person a personalized card depending on my level of quirkiness when I'm making my choices. 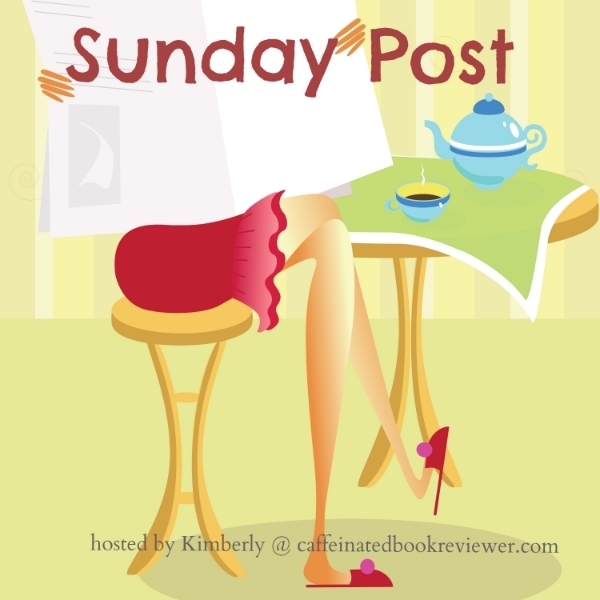 Don't worry about getting bombarded by email from the Paperless Post site. I've sent multiple cards to just about everyone I know over the last few weeks and none of them have received any kind of email other than the one I sent. I hope you enjoy the card as much as I do! *I did receive credits from Paperless Post at no cost in order to test the product. The opinions are completely my own. 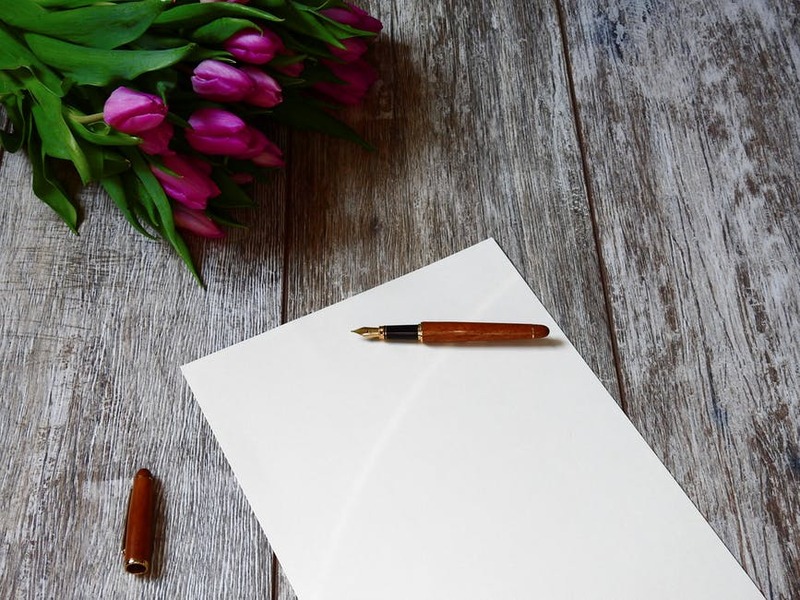 Have you ever thought of writing a respectful, but angry letter to ask them WHY they killed off one of your favorite characters in a novel? Most of the novels I read now are either mysteries where the dead people are unknown or unlikable or fiction with a pretty low death count. 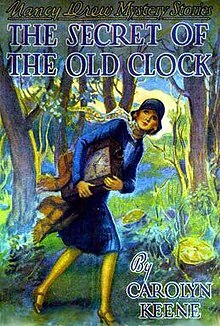 However, when I was a kid I was absolutely livid when Louisa May Alcott killed off a character in the sequel to Eight Cousins called Rose in Bloom. As an adult I can see why she killed him off but as a kid I was furious and definitely would have considered a letter if that had been an option. So I'm a huge fan of Murder, She Wrote. I'm not sure if it's because I have memories of my grandmother watching it when I was little, or the fact that they're just solid mysteries, or that I really think Angela Lansbury is fantastic. Regardless of the reasons I have done some serious binge watching of the show but somehow I never managed to read any of the spin off books. Until now that is! 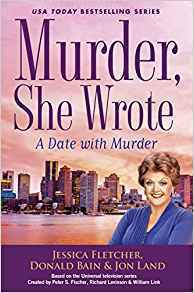 I couldn't resist a mystery involving online dating AND Jessica Fletcher so I'm now enjoying the coziest of cozies with Murder, She Wrote: A Date With Murder by Jessica Fletcher, Donald Bain and Jon Land. "Come on, Jess - everything's riding on you." While I would definitely trust Jessica Fletcher to take care of just about anything I do wonder what's going on in this beginning. It turns out it's a game of horseshoes and as someone who's super competitive I do see this as important! He flirted with the thinnest of smiles. "From reading your books, Mrs. Fletcher, I can tell you obviously know that's not the case." Did I mention I love Jessica Fletcher? She's just fantastic and she doesn't allow anyone to get all condescending on her. So what do you think? Keep reading? Are you a Murder, She Wrote fan? Description: Frank Malloy s latest client is the well-dressed Will Bert. He s searching for his brother, a newsboy named Freddie, so he can share his new financial good fortune. Frank makes quick work of the case and locates Freddie, but a happy reunion between brothers is not in the cards. When Will's name is mentioned, Freddie runs off only to be found dead a short time later. Suspicious, Frank tracks down Will who spins a tale of lust and deceit involving a young society woman, Estelle Longacre, also recently deceased. Frank can t be sure if Estelle's risky behavior and the company she kept was to blame, or if her own ruthless family had a hand in her death. Frank will need Sarah s help to unearth the dark secrets of the wealthy Longacres and to discover if there is a connection between Estelle and Freddie s death. Together they must navigate a perilous underground web of treachery to find the truth. Why I Picked This Book: I really enjoyed another book by this author and this series has been calling my name for quite some time. I really couldn't resist the blurb on this one either. Sounds like a great mystery! My Impression: It's official! I'm now a complete Victoria Thompson fan! I really enjoyed City of Lies which is the first book in anther series. She made the historic setting come to life and the characters were vivid but while it was a delight it was lacking a bit on the mystery end. I was excited to try this mystery in her long running Gaslight series and it didn't disappoint. Since we aren't being introduced to the world of Sarah and Frank Malloy the character development is a bit muted but I still found it to be enough that I could really get a sense of just who the characters were as well and a good picture of their marriage. I just finished watching The Alienist on TNT and the premise reminded me a little bit of that show. There are all these poor children that are left essentially to their own devices without anyone to care for them at what seems to be an impossibly young age. However, the way they looked out for each other was impressive and lacked the exploitation that I had seen in a show from a similar time period which made this much more enjoyable. The mystery itself is nice and twisty. Who would want to murder a young newsboy AND a young woman whose name is in the Social Register. What could their connection possibly be? And what was the man who came to Malloy in the first place posing as a concerned older brother's real purpose? Finding out was a thoroughly enjoyable ride with lots of atmosphere and a main character group that I'd really like to be friends with. Would I Read More of this Series/Author? Absolutely! Luckily for me I have several previous books on my shelves to keep me busy while I wait for #21! Would I Recommend this Book? If you enjoy smart historical mysteries this is a great choice. While this is a rather intimidating #20 in the series I had no problem starting here. 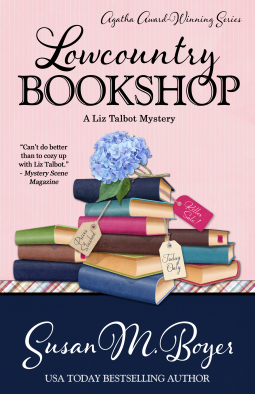 Description: When amateur sleuth and antiques expert Josie Prescott is called in to appraise a Japanese woodblock print and vintage guitar for her friend Mo, she’s thrilled—until Mo is murdered. It doesn’t take her long to pinpoint one suspect: Mo’s sister’s manipulative boyfriend, who sold her the print—and has now, conveniently, disappeared. Josie’s antiques know-how and detective skills soon lead her down an increasingly perplexing trail, scattered with gamblers, extramarital affairs, and under-the-table purchases. Readers will relish a return to Rocky Point with Josie as she works together with her friends—the ambitious young reporter Wes Smith, and Rocky Point’s savvy police chief, Ellis Hunter—to sift through the conflicting stories around them and find Mo’s killer. Why I Picked This Book: I think I read the first one in this series years ago and enjoyed it. As well I love antiques so a series set around an appraiser really appealed to me. My Impression: It's no big secret that I'm a fan of cozy mystery but what do I love almost as much? Art related mysteries! If there's a theft or a forgery to be had or a sketchy provenance there is no way I can resist. 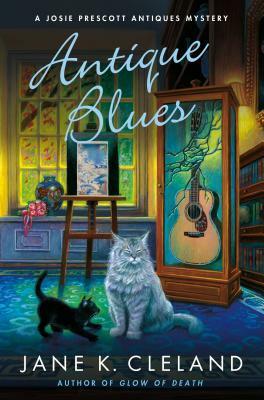 Now combine a cozy mystery with an art related mystery and the book is pretty much written for me. This series pretty much proves that point. While I don't remember if I read the 1st book I can guarantee you I'll be tracking it and the rest of the series down from this point on. So what was so great? For starters Josie's business as an antiques expert and appraiser isn't just window dressing. She shows up at work and the reader actually sees some of the work that goes into determining if a piece of art is the real thing or not. I liked this investigation mixed in with just who the murderer was and why had Mo been killed. The murder investigation does take a starring role and I was pretty clueless for quite some time as to just who had done it. I spent a lot of time trying to deduce just what was a red herring and what wasn't which added to my enjoyment of the reading experience. As well there's a team work element between Josie, Wes and Ellis which I loved. Needless to say I thoroughly enjoyed this book as it had a lot of elements that I personally adore. 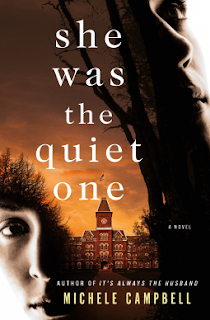 This is a great mystery with likable characters that work well together. If you love antiques, art or mysteries this is a fun series that shouldn't be missed. Would I Read More of this Series/Author? Absolutely! I need the first 11 books immediately! Would I Recommend this Book? Yes, especially if you enjoy cozy mysteries AND Antiques Roadshow. This was a lot of fun and I had no problem starting the series with this book. When I was a kid I was a huge Nancy Drew fan. I remember anxiously searching library shelves to find mysteries I hadn't read yet and being completely outraged that my Grandmother had donated my mother's collection during one of their movies. What I didn't know is that the version my mother read was most likely not the same version that I was read. I learned in the last few years that the Nancy Drew series was given a "refresh" starting in 1959 and I couldn't resist trying the original version and comparing it with the newer "modern" version. First Sentence: "It would be a shame if all the money went to the Tophams! They will flyer than ever!" First Sentence: Nancy Drew, an attractive girl of eighteen, was driving home along a country road in her new, dark-blue convertible. In the original version Nancy is 16 versus 18 in the later versions. Nancy's friends Bess and George are nowhere to be found and are replaced by Helen Channing who is described as a long time friend of Nancy's. The housekeeper Hannah Gruen is still there but she is the maid not the housekeeper and it's made very clear that Nancy is in charge of running the house which includes meal planning, ordering groceries, and working with a budget. The harrowing scene where a little girl runs into traffic which leads Nancy to meet the two elderly aunts, learn of a theft and discover the whole missing will in the first place is completely missing. Instead Nancy is already aware of the issues regarding the will and the questions surrounding it and comes into contact with two sisters who were expecting the inheritance on her own. Nancy herself is completely different. Instead of being constantly nice and charitable, Nancy can be a bit blunt. She dislikes the two Topham girls who seemed to be the beneficiaries of the will and doesn't really pull her punches. Instead of judging a store clerk for being gossipy she is interested and quick to encourage her confidences. And at one point she even withholds evidence from the police. To be honest I liked the 1930s Nancy way better. The writing style in general. The newer version is very simplistic and has an almost lecture-y tone at times whereas the original version is faster paced and more exciting. The lecture-y tone is gone in favor of just telling a good story. As well there was quite a bit about daily life that I found interesting. We see more of how Nancy runs the house as well as seeing the difficulties that two sisters she becomes friends with better explored. The basic plot and outcome is pretty much the same. Nancy is intelligent and pretty much left to her own devices to solve the mystery. I tried to read the two books 5 chapters at a time to really compare the two but the newer version was so simple and childish compared to the original version that I ended up stopping that. I'm not really sure what version I read but considering it was off library shelves I wonder if it was a mix. There are some that are really stuck in my head but others that have faded into nothingness. I wonder if the ones I vividly remember were the originals. I really enjoyed this reread of a old favorite and am so glad I took the time to revisit the world of the Nancy Drew and River Heights. If you're a fan of Nancy Drew I definitely recommend a revisit though maybe try and get your hands on the original version. I don't think you'll be disappointed! 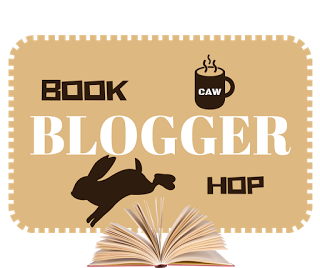 The Blurb: Soon after Gwenda moved into her new home, odd things started to happen. Despite her best efforts to modernize the house, she only succeeded in dredging up its past. Worse, she felt an irrational sense of terror every time she climbed the stairs. In her fear, Gwenda turned to Miss Marple to exorcise her ghosts. Between them, they were to solve a "perfect" crime committed many years before. Behind the Scenes: While this book was published in the mid 1970s it was actually written during the 1940s. Christie had kept in a safe deposit box as a gift for her daughter Rosalind and grandson Matthew. She had done the same with the final Poirot book Curtain. If you are reading the Miss Marple books in order of publication this one is a little amusing because a number of characters come back to life and Miss Marple's health dramatically improves. Why It's One of My Favorites: The premise is probably the main reason I love this one so much. Any mystery that involves digging into the past - especially one that is personal for one of the characters - is automatically going to be a winner for me and this is no exception. I have the scene where Gwenda opens the corner cabinet in the bedroom pretty much memorized yet I'm still gasp in surprise right along with Gwenda. I also love Gwenda and Giles. They're sweet and work together wonderfully. They don't dismiss Miss Marple's insights just because she's elderly though the do doubt her occasionally. Miss Marple shines in this one as well. She's not the primary focus her but is a significant side character and her insights are of course brilliant. She is also trying not to take over the investigation though she does encourage the couple to really think about different issues. 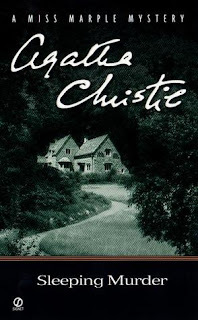 The book was written during a period of time where Christie was writing some of my favorites and best plotted mysteries and you can see it here. While the mystery is kicked off by a fairly large coincidence (which do happen occasionally as Miss Marple patiently explains) the mystery itself is fairly simple yet brilliantly obscured. It's one that when the reveal is finally done makes perfect and complete sense. I think this is a fantastic mystery to start reading Agatha Christie - especially if you are a cozy mystery fan as it does have the similar likable characters/amateur detective feel. And it has been and continues to be one of my absolute favorites. But what did Emma think? Go check out her review on One Reader's Thoughts to find out. Listening: I'm almost done with Big Little Lies by Liane Moriarty. I've been enjoying it and surprised by how much I connect with the characters. Watching: We got a new cable provider (because I wanted internet that actually worked more than half the time) so I've mostly been trying to figure out how to make everything work in the new over complicated box. I haven't been feeling great lately which has really been affecting my reading. It's nothing serious just really tired and headachey and focusing on a book seems harder than it should be. I've been up and down like this the last couple of months and it's starting to get beyond annoying! The past few weeks have been really crazy but I think this week is going to be different and I'm hoping that I can catch up on my rest. I had a nice visit with my grandparents. The weather cooperated and we watched some really wonderful movies. I'm growing my list of movie essentials that I'm looking forward to sharing. 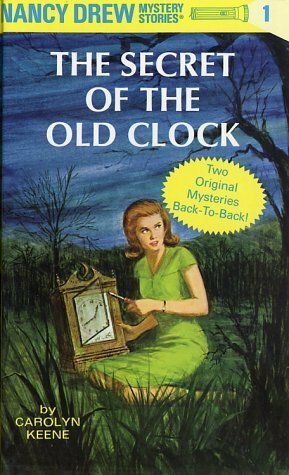 I've also got a new feature starting this week involving Nancy Drew books. I'm comparing the original version with the one that was rewritten in the 50s and 60s. So far it's been really interesting to me at least. Monday: Ramblings from the Stacks - Is This Book Too Dated? What do you have going on this week? What are you reading? Description: In the year 2045, reality is an ugly place. The only time teenage Wade Watts really feels alive is when he's jacked into the virtual utopia known as the OASIS. Wade's devoted his life to studying the puzzles hidden within this world's digital confines, puzzles that are based on their creator's obsession with the pop culture of decades past and that promise massive power and fortune to whoever can unlock them. When Wade stumbles upon the first clue, he finds himself beset by players willing to kill to take this ultimate prize. The race is on, and if Wade's going to survive, he'll have to win—and confront the real world he's always been so desperate to escape. Why I Picked This Book: I heard this was a science fiction book for people who didn't really like science fiction and I was curious about Wil Wheaton's narration. My Impression: This one took awhile to figure out how to rate. There were several times throughout the book where I really just didn't care and was seriously thinking about DNFing it and then there were other times where all I wanted to do was find out what happened next. To be honest I'm not sure I would have made it through if I wasn't listening to the audio version. There's a lot of world building and setup at the beginning and it took forever for me to get into the story. I think this is one of those "it's not you, it's me" moments as the world building is really excellent and well done but that aspect in general just doesn't hold my interest. There's a reason why I've only read a handful of dystopian and science fiction books. When the quest starts up I was fully in and started enjoying the story. Then around halfway through it stalls and it seems like Wade does a LOT of whining for awhile. Just as I was about to give up it starts back up again and for the last third or so I was completely hooked and couldn't wait to find out just what happened next. I enjoyed the 80s pop culture references though not being super into arcade games I didn't get quite as much enjoyment as I would have otherwise. The friendships between Wade, Aech, Art3mis and Shoto, and Daito was one of my favorite elements of the story and I loved the moments where they were working together. The quest itself was my favorite part. I enjoyed being inside Wade's head as he figured out the different clues and came up with different plans. While the ending was satisfying I would've loved an epilogue to get a little glimpse about what happens next but that's more the fact I like my endings overly completed. While there were lots of slow parts for me I ended up enjoying this story very much. If you're not sure it's for you I highly recommend the audio as Wil Wheaton does a spectacular job and just his voice and interpretation alone got me through a few times where I really felt the story was dragging. Now the big question now - will I go see this in film form? Answer - probably not. While I did enjoy this in book form I don't really have a desire to revisit this world. If it came on HBO I'd probably give it a try but I won't go out of my way. Would I Read More of this Series/Author? Probably. 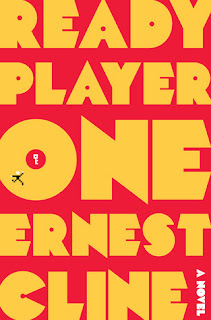 I did enjoy this one and if Wil Wheaton was narrating another book I'd give it a try. Would I Recommend this Book? Yes with reservations. If you like quest type books I think you'd enjoy the bulk of this book. And I highly recommend the audio version. For ebooks I have a list of reading order based on review commitment dates. For print books I have kind of a stack filing system. The next 5 upcoming books are stacked in order that they need to be read and I also have a list for them as well. It works pretty well but for the print books especially I'd like to have a neater system. This week's book is a historical mystery in a series that I've been wanting to read for quite some time. 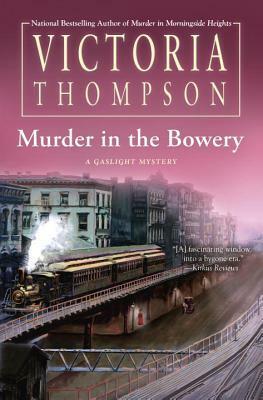 I loved a book from another series by Victoria Thompson but I've bene wanting to read her long running Gaslight Mystery series so I'm starting with Murder in the Bowery. "I need you to find my kid brother, Mr. Malloy." I love a missing persons case! The room was dark and dank, lit by feeble electric lights and cooled by the water they kept dripping over the bodies to slow decay until they could be identified. Well that's a bit gruesome! I never thought about how they slowed decay before there was refrigeration but it does make sense. So what do you think? Keep reading? How do you keep track of all your books?